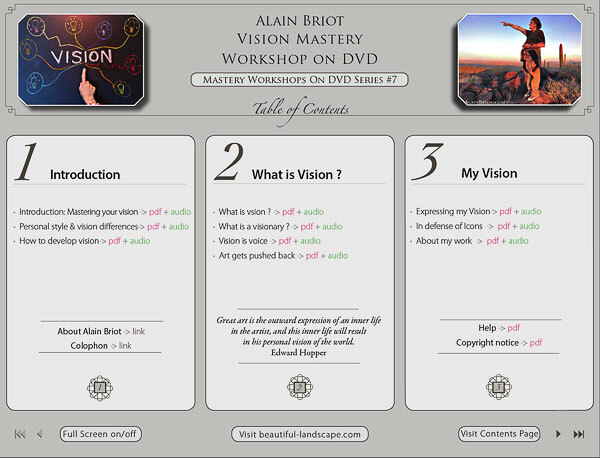 A new Mastery Workshop on DVD,The Vision Mastery Workshop on DVD, is available. This is the 7th Mastery Workshop on DVD (you can see the entire collection here). It is also the logical continuation of the Personal Style Mastery Workshop on DVD. Vision is the seed of personal style. Vision is an idea, and this idea comes to life and is made visible through your personal style. In other words,your vision gives birth to your style. Style is based on techniques while vision is based on ideas. One can have a personal style without a vision, but one cannot have a vision without a style. This means that while few people have a personal style, even fewer have a personal vision. Vision has been the main focus of my research for the past 2 years, and my writing for the past six months to a year. So much so that I consider 2014 to be the year of vision. The outcome of this research is the Personal Vision Mastery Workshop on DVD. Since I started working on this project my work has focused on one of the main contents of the Personal Vision Mastery DVD: the section dedicated to the creation of your Body of Work. The research I conducted for this section has led me to a full-fledged investigation of my own body of work. This led to 'digging out' all the work I created from the time I was about 5 years old until today. While I am fortunate to have much of my work still in my possession, the quantity was overwhelming. The process I followed entailed finding, organizing, filing and finally photographing my entire body of work, a collection that features thousands of pieces. At this point this process is now completed and the entire collection has been photographed. The photographs have been processed, converted, optimized and organized in categories (44 separate categories in all). The categories were organized in chronological order and separated by medium and subject matter. The next step is to create digital presentations of these categories and finally create a comprehensive tutorial on how to assemble your body of work. This is the step I am currently working on. This essay was written prior to the Personal Vision Mastery Workshop on DVD being published. This tutorial is now available. You can download the updated table of contents and the detailed description at this link.